The kind of attachment we form with our primary caregiver(s) when we are infants can have a great impact on our future relationships. Healthy interpersonal relationships are one of the most important elements of our sense of happiness and well-being. During the 1980’s, Cindy Hazen and Phillip Shaver applied attachment theory to adult relationships because of the shared similarities between adults and between children and their caregivers. Their claim is that, though relationships between adults differ from relationships between children and caregivers, the core principles of attachment theory apply to both kinds of relationships. Securely attached adults have no problem feeling emotionally close to others; tend to be comfortable depending on others and having others depend upon them; are not uncomfortable with being alone; and do not generally worry about being accepted by others. They usually have positive views of themselves and their partners. Secure attachments are promoted by having had a caregiver who is emotionally available and responsive to their child’s needs. Adults who have developed an anxious-preoccupied style of attachment tend to seek high levels of intimacy, approval and responsiveness from their attachment figure. Often, they become overly dependent on the attachment figure. They tend to have a less positive view of themselves, doubting their self-worth and blaming themselves for the attachment figure’s lack of responsiveness. They often become anxious or preoccupied when not in the presence or in contact with the attachment figure. People who are anxious or preoccupied with attachment may exhibit high levels of emotional expressiveness, worry and impulsiveness in their relationships. People with this kind of attachment tend to have low self-esteem and view their partners more positively than they view themselves. In this case, the parent is inconsistent in responding positively to the child and being sensitive to the child’s needs. This puts the child in a state of constant agitation about how the parent will react to them. There is an over-activation of attachment circuitry in the brain. People with a dismissive style of avoidant attachment seem to be comfortable without close emotional relationships and they value independence and self-sufficiency. The desire for independence often appears as an attempt to avoid attachment altogether. They view themselves as invulnerable to feelings associated to being closely attached to others and often deny needing close relationships and/or see them as unimportant. They often hide or deny their feelings and deal with perceived rejection by distancing themselves from the sources of rejection. There is a defensive quality to this attachment style. People with this attachment style tend to view their partners more negatively than they view themselves. This style of attachment is an indication that the parent did not respond to the child’s signals and often either ignored, misread or responded with impatience or frustration. In order to cope, the child minimizes activation of the attachment circuitry in the brain. 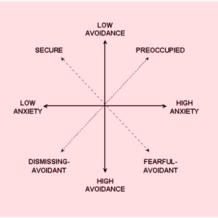 People with a fearful-avoidant attachment style often have experienced losses or other trauma, such as sexual abuse, in childhood or adolescence. This kind of attachment can also be created when the parent shows a severe lack of attunement; when they are frightening to the infant; or when the parent is frightened themselves. Though they want to have emotionally close relationships, people with a fearful-avoidant or disorganized attachment style find it difficult to trust and depend upon others, i.e., they have conflicted feelings about close relationships. These mixed feelings are often combined with sometimes unconscious negative views about their partners or themselves. They often view themselves as unworthy of responsiveness from their partners and don’t trust their partner’s intentions. They are often uncomfortable expressing affection because they frequently suppress or deny their feelings, thereby minimizing the attachment circuitry in the brain. If you are interested in finding out your own attachment style, take the “Romantic Attachment Quiz” at: www.psychcentral.com/quizzes/romancequiz.htm.